Hidalgo is an action-adventure and one man's journey of personal redemption. Based on the life of Frank T Hopkins, his legend comes to life when one of the greatest riders the American west has ever known is pitted against the world's finest Arabian horses and racers. Touchstone Pictures' Hidalgo, directed by Joe Johnston from a screenplay written by John Fusco, is produced by Casey Silver. Don Zepfel is the executive producer. Buena Vista Pictures distributes. In making Touchstone Pictures' epic motion picture Hidalgo, the filmmakers were excited to have a film that blended spectacular action and adventure with a story of one man's journey of personal redemption. "I think audiences everywhere will connect with the story of Frank Hopkins," says Casey Silver, producer of Hidalgo. "There's an exciting race that frames the story, but the real race is this man's race to find himself, to find forgiveness within himself for his transgressions - the themes are compelling." The story of the cowboy Hopkins and his mustang, strangers in a strange land as they become the first American and non-Arabian horse to compete in the toughest endurance race the world has ever known, Hidalgo stars Viggo Mortensen as a man billed as the greatest distance rider the West has ever known. "Getting a story worth telling is always the most important thing - and sometimes, it's a gigantic challenge," says Silver. "But screenwriter John Fusco makes it easy. He came in, telling this story that was so important to him - it came right from his gut. I have such an appreciation for his talent and it's an honour to be a part of telling the story he told me." More than fifteen years ago, Fusco discovered the kernel that would eventually grow into the film Hidalgo. A dedicated student of the American West, Plains Indian culture, and horses, Fusco discovered the story of Hopkins and his mustang while doing conservation work with horses of original Native American bloodlines. "I was doing some research into the classic Indian ponies that you see in Remington and Russell sculptures, and this name kept coming up - Hopkins - who rode a famed Indian pony, named Hidalgo. Reading about them, it led me to this legendary race across the Arabian desert. There was only so much that I could find on them, but it was enough to tell me that this was an incredible story." Fusco, who has also written the screenplays for Thunderheart, Young Guns, Young Guns II, and the recent Academy Award-nominated animated feature, Spirit: Stallion of the Cimarron, spent about 12 years researching and writing the screenplay. He referenced 70 years of collected writings on Hopkins and Hidalgo by such noted historians as J Frank Dobie and Dr Ruy d'Andrade. He also drew from the oral histories of Native American elders and grassroots ranchers in Wyoming in uncovering the amazing adventure. Earlier this year, Fusco was awarded his second Western Heritage Award, a research prize from the National Cowboy Museum. "It's a remarkable story. It requires digging through a lot of historical layers because it's a real gem," says Fusco. "Ultimately, this is a classic hero's journey," says Mortensen, who plays the legendary rider. "Hopkins has to leave his familiar surroundings, and overcome, in a strange place, the obstacles and dangers in his path. "What's really interesting about the Ocean of Fire race is that it doesn't really matter who wins in the end," Mortensen continues. "It's a question of getting through it, and what happens to a person as a result of going through that experience." To direct the film, Silver tapped Joe Johnston, a director who has showcased his ability to capture emotional intimacy with October Sky, epic vision in Jurassic Park III, and sheer originality with Jumanji. "There are very few directors with the kind of expertise and range that Joe Johnston can bring to a motion picture," says Silver. "Hidalgo is one of those rare motion pictures that contains all of those elements, and Joe's passion and vision has brought a great true story to life. "I had hired him to direct October Sky, but that was the only movie we'd worked on together," Silver continues. "I don't think anybody could have done a better job with that movie. I think his restraint makes him one of the most underrated American movie directors. I thought that Hidalgo, in the wrong hands, might be jingoistic, and overly sentimental, or corny - but Joe brings a stoic sensibility. He lets the story unfold with a minimal amount of manipulation." "I wasn't looking for work when Casey asked me to read the first draft of Hidalgo, but once I started reading I couldn't put it down," says Johnston. "It was almost like reading a best-selling thriller. When I closed the script I knew I couldn't say no. Opportunities like this come along once in a career, if you're lucky. I knew that the action and set pieces, the epic scope of the story, could make a visually stunning film, but the element that appealed to me most was the simple story of this lost soul and his best friend, who happens to be a horse. At the heart of this amazing adventure is the story of this man running from himself, not knowing who he is. His ordeal by fire, this impossible 3,000-mile horse race is the catalyst for his rediscovery of who he really is and what his life means. "In order for the story to work the audience has to care, not only about Frank Hopkins, but about his horse and the relationship that holds them together," Johnston continues. "I was conscious of the fine line we were walking with that relationship. I wanted to make sure we never humanized the horse, made him 'superhorse.' In a way, that's the easy solution, to push the believable limit of the horse's intelligence - he could never be Trigger, or Silver, or Lassie. I think it's more compelling to keep the two main characters within the realms of their species, because the reality you've set up will pay off emotionally in the end. We wanted to treat the horse as a partner, but in the way a real horseman in 1890 would do it. There's no doubt who's in charge - the horse serves the man - but theirs is a uniquely close and humane relationship." "Joe handled the material incredibly well," says Mortensen. "I liked the movies he's directed, and I liked meeting him, but it's not until you start meeting challenges together, as a team, that you know what the movie's going to be like. But not only was Joe a professional, but an optimistic and calm presence at all times - a very 'can do' sort of person. If something wasn't working out, he clamly sat down with the team and worked it out. It inspires confidence in the actors and the crew." The role Frank T Hopkins required an actor who could portray a complex emotional range while also tackling serious athletic feats. As this would not be an ordinary film role, the film required an extraordinary actor, one who could carry a film that would take on epic proportions. Johnston and Silver turned to Viggo Mortensen, an actor who is a veteran of more than 30 feature films and most recently shot to stardom as Aragorn in the Lord of the Rings trilogy. With rave reviews and extensive riding experience from those films, Mortensen was one of the few actors who had both the acting and the riding expertise needed for the role. something unexpected happens while the camera's rolling, he does the right thing. "But the best thing about Viggo is how much he cares about the project," Johnston continues. "He's always there, always ready, and doesn't walk away from the movie at wrap every day. The bottom line is, he makes the filmmakers look good." "Viggo has that indescribable quality called 'presence'," notes Silver. "Even when he was first starting out, when he had a very small role in Witness, he stood out in the crowd. I find his role in Carlito's Way particularly memorable. But maybe this is all a result of his being less interested in being a 'movie star' than focused on story and character and his private interests, his photography and his art; he's a social activist and a father." "Frank is an outsider," says Mortensen. "This is a man, a cowboy, who's probably never even seen the ocean, and now he's got to hack it in a 3,000-mile race in the Arabian desert. He doesn't know if he can cut it. And he's at a point in his life when whatever arrogance or confidence he had is pretty much gone, and all he has is his experience with his horse." Mortensen was fascinated with the David-versus-Goliath nature of the story. "The odds are stacked against Frank," he continues. "Compared to the Arabian horses, the mustang Hidalgo looks like a little dog. A pony, next to their steeds. But though the race is his redemption, it's not winning the race that's important - it's that Frank is there at all. "By the end of the story, I think you really appreciate the fact that as human beings, no matter how diverse the culture is and how far-flung the places you go to might be, we have a lot more in common than not with people," explains Mortensen. Another attraction for Mortensen was the opportunity to work with screen legend Omar Sharif, who plays Sheikh Riyadh. "We were filming in some of the same locations that he was in forty years ago, filming Lawrence of Arabia with Peter O'Toole," notes Mortensen. "And he's got a really good memory and a lot of good stories. Wherever we went, he'd have some story of what it was like to film that movie. He's a fine actor." "When we were filming Lawrence, we were the first to go to Ouarzazate (Morocco), where we shot the big part of Hidalgo," notes Sharif. "There were no hotels then. We just pitched tents. Now, there's a big film industry. It's almost like Hollywood over there now." Sharif is an Academy Award-nominee and three-time Golden Globe winner whose most recent film, Monsieur Ibrahim, was nominated for a Golden Globe for Best Foreign Language film. That film and Hidalgo brought the actor out of retirement. "I hadn't worked since 1996, really, because I wasn't being offered any roles that truly appealed to me. But I was living in Paris when I found Monsieur Ibrahim, and decided to work again. And while I was working on that film, I was offered this part - the first good part in a major studio film that I'd been offered in a long time. Even thought I was in the middle of the other film, I'm glad we found a way to make it work. I've enjoyed making this film, working with Viggo and Joe, and I've been enthusiastic about this role." Silver notes, "We are fortunate to have Omar Sharif in our cast because he is very selective about the roles he takes these days. It speaks well of the script." Zuleikha Robinson, who makes her major motion picture debut with Hidalgo, takes on the part of Jazira, Sheikh Riyadh's high-spirited daughter. Born in London, Robinson was raised throughout the world, bringing an international flavour to this internationally themed project. "Jazira is a very strong character who is bound by her culture," notes Robinson. "She always tries to test her father's boundaries, and so, they have a very interesting relationship." The international ensemble cast also includes Louise Lombard as Lady Davenport, Silas Carson as Katib, Adam Alexi-Malle as Aziz, Said Taghmaoui as Bin Al Reeh, J K Simmons as Buffalo Bill, Adoni Maropis as Sakr, and Elizabeth Berridge as Annie Oakley. Just as much thought and energy went into the casting of the title character as any of the human characters. Although five horses would play the pony, there was one, T J, who the others were painted to match. "T J has a real personality," says Mortensen. "It's uncanny, some of the things he does. We'd be rehearsing, and I'd wonder, 'How is this ever going to work?' - and then T J is doing exactly what he should be doing... it seemed like every time we rolled film, T J would be perfect. It happened too often for it to be coincidence. We were lucky to have him." Of course, this is not to say that the success hasn't gone to the horse's head. "We would finish a scene - I got off T J, and he would follow me around, to make sure he got his close-up," Mortensen laughs. In the end, the relationship between Frank and Hidalgo was mirrored between Mortensen and T J. When production wrapped, Mortensen purchased T J and now keeps the horse. Obviously, to play Hopkins, Viggo Mortensen would have to spend many hours on and around horses. The actor turned out to be an ideal choice, as he had been riding horses since his youth, and his recent starring role as Aragorn in the Lord of the Rings trilogy also required some horsemanship. That said, Mortensen still needed a refresher course. "I rode a lot as a child, but from age ten on, I hadn't ridden much. There was riding in Lord of the Rings, but it had been a good part of a year since then." For training, the filmmakers turned to Rex Peterson. For Mortensen, an actor known for his dedication to his craft, Peterson proved an ideal mentor. "We were fortunate to have Viggo," says the gruff trainer, who does not hand out compliments lightly. "I can't think of another actor that rides better. And he's worked very hard at it." Mortensen is quick to return the compliment. "Rex was strict, but for the best possible reasons. He was a really good teacher... and a perfectionist." Though preparing to play Hopkins required Mortensen to spend hours every day training with Peterson, he never complained. "You have to be able to adapt," he explains, "I mean, they're not cars... they're not machines. They're like us and they have good and bad days. Sometimes they do unexpected things, and you have to be ready." Not only did Peterson serve as trainer, but also adviser to Mortensen on cowboy attitudes - to the point that a joke on the set called Viggo "Rex, Jr". Peterson dismisses this, but acknowledges, "Viggo does come and ask me questions. I grew up on a ranch and didn't come into the movie business until I was 20-something years old. I've known a lot of different cowboys, and this business has given me the opportunity to meet many, many different horsemen. I've been very fortunate in that respect. "But sometimes Viggo would ask me, 'How would you say this? 'Viggo, I didn't live in the 1890s. I don't know.' But this all comes from Viggo's desire for this production to be as authentic as possible. I put everything into this movie - I'm here, daylight to dark, every day, and it's good to see other people with the same level of commitment." Peterson is a veteran of 25 years in the film industry, serving on such films as The Horse Whisperer, Runaway Bride, Black Beauty, and The Black Stallion. Even among such credits Hidalgo stands out in the trainer's long career. "I really wanted to do this film because I thought it was the best script about horses that had come down in a long time," Peterson adds. "As things progressed and Joe presented his vision of the movie, I thought we had the makings of a classic." Peterson spent about three months on his search for the "hero" horse, Hidalgo, which would be used for the film's close-up shots. How does a horse audition? 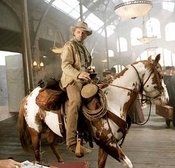 Not only did the horse have to look right - in Hidalgo's case, be a male mustang, 4 to 10 years old, sorrel-and-white - but also gentle enough for an actor to ride. "Sometimes, I would get a call to look at a horse, walk into the barn, and walk right back out again," says Peterson. "I'm sure I left quite a few people asking, 'Well, why didn't he pick my horse?' But it's just a matter of not fitting my criteria. In those cases, I didn't even bother to show him to the director. Still, I must have shown Joe a hundred horses before we ended up with T J." After finding him, his next priority was to find Hidalgo doubles and other horses to be used in the motion picture. Ultimately, there were five horses playing Hidalgo, with the doubles used for different aspects of filming, including tricks, jumping, racing, etc. Make-up artist Garrett Immel took the responsibility of finding a way to make up the doubles to match T J's colouring. In addition, Peterson had to find several Arabian horses to play Hidalgo's competitors in the Ocean of Fire. He spent an additional three months training the horses (and the riders) for their various roles. "It was important for the actors to be confident, to be relaxed," says Peterson. "When they get in front of the camera, they can't be thinking about the horse under them. They have to think about their acting." Responsible for caring for the animals in the production, including the horses (800 of them! ), camels, vultures, falcons, rabbits, goats, dogs, donkeys, burros, leopards, and buffalo, among others, was animal coordinator Mark Forbes. "You name it, we got it in this show," he laughs. "You have to get each of the animals used to the other animals' trainers," Forbes notes. "They have to get used to the situation. It takes a lot of preparation." In Hidalgo, the film required an extraordinary chemistry between man and horse. It was important that Viggo Mortensen have a similar chemistry with the horses playing Hidalgo - especially with T J, the close-up horse. "The only way to provide that is to go out and find the horses and then introduce them to the actor, have the actor work with them," says Forbes. "With Viggo, that was never in question. Another actor might say, 'Well, I can give you an hour in the morning.' But Viggo is so committed to the work; he's there at eight, he leaves at five, after riding all day long. He does his homework. He cares. I wish everybody would go to the 'Viggo Acting School.' Because he's completely down-to-earth." Forbes' biggest challenge though, was one of coordination: simply moving all of the animals to the film's different locations around the world. "When you have as many animals as we did, filming in am many different locations around the world as we did, just the paperwork and logistics involved in moving the animals around is a daunting task. When you add in everything that you have to do to make sure that they're well-kept and cared for, it's an even bigger challenge. But we were all committed to making sure that the animals lived as good as, if not better than, our human stars." Forbes adds that there were some 25 different species of animals used in the film. And, of course, safety to both the crew and the animals is an additional responsibility when working with dozens of horses in such diverse terrain. A member of the American Humane Association was on set every day of filming to monitor animal handling. Viggo Mortensen's commitment to authenticity on the set of Hidalgo was mirrored by the director, Joe Johnston, and the crew of the picture. Two members of the crew, especially - production designer Barry Robison and costume designer Jeffrey Kurland - went to extraordinary lengths on this complex project. "This is a film that takes place in 1890 in the American west, so we had to be prepared for the cowboy look; the American east, the New York of the 19th century, and that very different attire; and finally, the far east of 1890," says Kurland. "This isn't a western; it's an 'eastern'!" Kurland had many of the fabrics and jewelry made in both the United States and in Morocco. He was also able to purchase some of the Arabian clothing and accoutrements in large Moroccan cities like Marrakech. But some costumes required a little more ingenuity. "To make a costume, you design it, then the draper figures our how to make it. You get the fabric, you swatch it, you buy it. Only then can you make it, and after you make it, you have to age it so that it doesn't look brand-new," Kurland relates. "I had a man named Yussef who wove many of my fabrics," Kurland continues. "He could weave fabrics to the colours I asked. He made me six meters of fabric in two weeks, which is extraordinary. I was also very lucky to have some of the best ager-dyers working for us." The film's many locations also required Kurland to design costumes for a Native American Ghost Dance. "The more research we did, the more we were able to find amazing photographs and histories that helped us to get it right," he says. "There are subtle differences between tribes, in what their ghost shirts and dresses were made of. Some were made of animal skin, but for the tribe in the film, we decided that it was most likely that they were wearing muslin. This was, unfortunately, a time when the Lakota Sioux were destitute; there were no animals to hunt." The actual filming of Hidalgo takes place in a variety of locations, including Montana, Morocco, South Dakota, and California. Logistically, it proved to be a demanding task to transport the large crew around the United States and Africa. A film set in so many diverse locations required the crew to be flexible as they figured out how the main sequences - including the Buffalo Bill Wild West Show, the Ocean of Fire race in the Arabian Desert, the Wounded Knee tragedy, and the New York City docks - would be designed and filmed. Robison, who previously worked with Johnston on critically acclaimed October Sky, was on the road almost constantly, having to build sets in California, Morocco, and South Dakota. "Hidalgo is like doing three or four separate movies," notes the veteran designer. "We've got a New York dock. We've got a Wild West show. We've got the race. And we have the western town - the horse release, at the end of the film. It's a rich film for a designer, because there are so many different looks to create. "I get a special charge out of the scene at the New York docks," Robison continues. "We flooded a parking lot in Southern California and built a boat to scale. It was a cool set to do - to recreate 19th century New York. "Joe's an incredible visual director," Robison notes. "He could have made the decision not to build all the great sets we had - he could have made them all CG, and we do have some CG in the film. But, for the most part, Joe made a decision early on in the film to create as much of this world as we could." Not surprisingly, the biggest challenge came with the sets in Morocco. Not only were the sets the largest and most complicated of the whole shoot, but the weather would often get in the way. "The dust was a huge problem for us," Robison notes. "We were in some major, major windstorms. Every day, at one o'clock in the afternoon, the winds would kick up in the desert; and every night, we'd have to take down our tents for repairs. It really happened every day, but the first time, it was just horrifying. "It's been a great shoot, though, and a chance to do something really different," he concludes. "The first time Joe came to the set, he was walking around the casbah and asked, 'Was this gate here?' No, the gate wasn't there - we built it. You couldn't tell where the real ended and the movie began. That's been great." Director Joe Johnston is no stranger to visual effects in films. The veteran director has helmed a number of films that required a large number of visual-effects shots (including Jurassic Park III and Jumanji). In addition, before he became a director, Johnston won an Oscar for his work in creating the visual effects for the classic Raiders of the Lost Ark. But Johnston, also the director of the more intimate drama October Sky, was determined that Hidalgo would blend the best of both worlds. With his experience on Raiders, Johnston was determined to shoot "practicals" whenever possible - and rely on visual effects only for those shots that required them. Johnston originally planned only 70 effects shots for the film, and though that number would triple in the end, it would still mean that Hidalgo had less than half the number of visual effects shots of most action films and one-tenth as many as a visual-effects-heavy film. For those elements, the filmmakers turned to Industrial Light & Magic's Tim Alexander, who served as visual effects supervisor. "In pre-production meetings with Tim, I gave him an unusual directive: I didn't want anyone coming out of the theatre saying what great visual effects they'd just seen," says Johnston. "Tim knew exactly what I meant. The best visual effects are the invisible ones, effects that blend seamlessly with reality." "What I'm proud of is that out of 215 shots, there's less than 20 that you might notice as being CG - the sandstorm, the locusts, the leopards - and even those, hopefully don't stick out like a sore thumb," says Alexander. "The rest are composites and bluescreens, and if we're doing our job right, you won't even notice that those shots have been worked on at all." "A large part of ILM's work in Hidalgo was in helping the desert become a character in the film," says Johnston. "One reason I wanted to shoot the film in a widescreen format was to surround the characters with the terrible beauty of the desert landscape. The desert is always there, reminding us of the hostile environment of the race. But unfortunately, in moving an army that speaks five languages, it's difficult to control all the troops. One of the biggest effects jobs in the film is making the desert pristine and unscarred, using computers to remove tire tracks, distant trucks, tents and horses, even contrails from passing planes." Alexander's job began during production, when he was able to use daily film footage and still photography to show Johnston what certain shots might look like after they were completed months down the line. "We could take video from the video tape - they were using mini-DV tapes - and I could just import that to my Mac. I could actually get moving footage of what we actually shot on my computer and mock things up that way. Other times, we would go out on a scout, and we would take still photos and come back and show Joe the still photos. In general, it made us really well-prepared," Alexander says. Upon returning to ILM, Alexander and his team - Sylvia Wong, Robert Weaver and Eddie Pasquarello - turned their attention to the film's three major visual-effects sequences - the sandstorm, the locusts, and the leopard chase. "At first, we didn't know what we wanted the sandstorm to look like," he says. "But then, there we were in Morocco, and we went through quite a few real sandstorms. It turns out that in real life, they're very amorphous - there's no edge to them; you just get foggy-looking and the light blooms out. At first, that was our original concept for the sequence, but Joe made the decision that it wouldn't work for the storytelling that way - he said, rightly, that it would be better for the story if the storm came in like a wave, rather than a shapeless blob. Still, we wanted to do something different, so we latched onto the idea that we would see the internal motion of the wave, giving the idea that the storm was almost like a vacuum cleaner, sucking up sand from the ground and blowing it up the face of the sandstorm." The locust swarm sequence had similar challenges. "We struggled with that first shot for quite a while as we tried to figure out what the light would do, how much they should block the sun, and what the shape of the swarm should be," Alexander notes. "What we did in the end was to have the first shot as a horizontal cloud in the distance - then the locusts slam down on the camera very quickly. In the closer shot, we'd have them flying through camera. We were really trying to make it look sinewy, almost like schools of fish - if you look at it closely, you'll see that they follow each other and change direction and shape." Alexander and his team found an unusual source for their research - the 1937 classic The Good Earth. "There's a really interesting locust swarm in that movie, and that's where we got the idea for the sinews," he says. "It was obvious that they had gone and shot some grasshoppers or locusts or whatever they were able to get and then just composited those into the final film - you can tell that it's done that way, but we liked it because it was really organic. It was real." For the scene in which the leopards attack Frank, though the filmmakers intended to use CG imagery from the very beginning, they were constantly aware of other choices. "At one time, we looked into doing them practically, but there's just no way," says Alexander. "You can't get them anywhere near horses - they're mortal enemies. After that, we considered split-screen work, but still, CG seemed the best way to go. The real leopards, it turns out, were pretty docile creatures. It was hard enough to make them snarl or growl, much less run or swipe when we wanted them to swipe. It turned out to be a good decision."